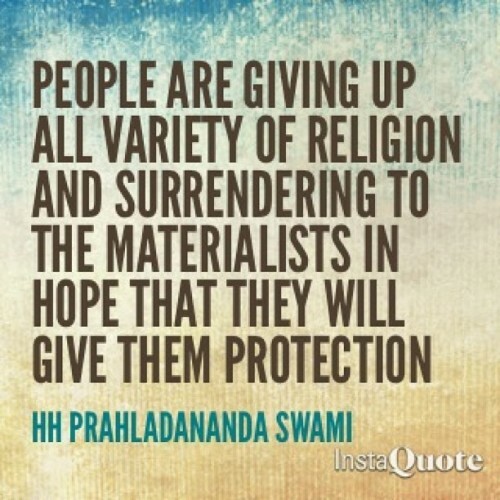 HH Prahladananda Swami: I am very happy to be here and have the opportunity to say something as an aspiring servant of Srila Prabhupada so that perhaps I myself and others may more deeply appreciate Srila Prabhupada, Lord Caitanya Mahaprabhu’s mission, and the goal of life to become fully Krishna conscious. That one should not become a father, one should not become a mother, one should not become a guru, one should not become a husband, one should not become a worshipable demigod and one should not become a father and mother unless one is prepared to deliver one’s disciples or followers from the path of repeated birth and death. The whole goal of everything we are doing or the whole goal of whatever responsibilities we have is to help our dependents understand that they are dasa dasa anudasa, that all of us should be the servants of the servants of the servants of the servant of Krishna. That mood has been fully manifested in this world in this dark age of Kali by His Divine Grace A C Bhaktivedanta Swami Srila Prabhupada. And for that reason he has tried to inspire by his example by his instructions that same desire within all of us to simply convince people that Krishna is the Supreme Personality of Godhead. Those who have not followed that path although they may be mother, for instance Bharat Maharaj his mother tried to dissuade him or tried to encourage him to take over the position of Lord Ramachandra. But he rejected his mother because of that. Sukracarya he was acting as the spiritual master but he was not encouraging Bali Maharaj to surrender to Krishna to Lord Vamanadeva and therefore Lord Vamanadeva did not obey him. Similarly we have those who have been fathers, mothers, demigods, worshipable spiritual masters, husbands, but unless they try to instruct their followers, their disciples, their dependents, on how to surrender to Krishna then it is not very fruitful to follow their instructions. And what are those instructions ultimately meant for? How can you possibly conceive of who is actually Krishna? How can you imagine someone with unlimited beauty, unlimited strength, unlimited fame, unlimited wealth, unlimited renunciation? But we can hear about Him. We can hear about the pastimes of Caitanya Mahaprabhu and understand something about the Supreme Lord’s unlimited renunciation. You can hear Krishna’s pastimes in Vrindavana how the lakes, the trees, the cows the deer the Gopis everyone and everything was attracted to Krishna. We can hear Bhagavad-gita and learn about Krishna’s unlimited knowledge. So from the very beginning to the very perfectional level it is the same process. What is that process? Simply try understand about Krishna. Try to accept that He actually is the Supreme Personality of Godhead and the goal of life is to hear from Krishna and from His representatives. Srila Prabhupada has given us a big, big mission, that’s called the sankirtana movement. Krishna is not present here but He came five hundred years ago as Caitanya Mahaprabhu. So five hundred years ago Caitanya Mahaprabhu showed us how to manifest the rasa dance in this world, how to manifest, practically speaking, Krishna’s pastimes in this world of Kaliyuga. There is absolutely no difference between the rasa dance and the sankirtana movement. When the devotees who are chanting and dancing in ecstasy they are actually engaged in the rasa dance with Krishna. When they are distributing books to the conditioned souls they are actually acting in the same mood as the Gopis trying to bring other Krishna’s servants to please Krishna. When the devotees are taking prasadam it is equally good as if we were in Vrindavana, as if our consciousness it there with Caitanya Mahaprabhu in Vrindavana. It is equally as good depending upon our consciousness so therefore in the beginning although we may be engaged in these activities still there is tusyanti there is satisfaction, we are doing the right thing. We are actually engaged in Krishna’s pastimes we are actually with Krishna and His devotees and then as we actually gradually accept this process, as we gradually accept that we are not only Krishna’s servant but we are actually the servant of the servant of the servant of the servant of Krishna. Why do we suffer? We are only suffering because we don’t know understand that everyone is Krishna’s eternal servant. Not a blade of grass is moving in this world without Krishna’s desire. So here is a question. We are there on book distribution, we are there preaching, we are there doing service; why do we find ourselves in so much difficulties at times? What is the ultimate difficulty? Prahlada Maharaja says that there is no actually enemy in this world except for the uncontrolled mind. “For those who can see Me everywhere and can see everything in Me I am never lost to him nor is he ever lost to Me.” So why don’t we see Krishna everywhere? Why do we not see everything in Krishna? Why are we forgetful? So Krishna says is it My fault? Many people blame Krishna. One devotee approached Prabhupada and said “Prabhupada, everyone is criticizing me.” Prabhupada said, “Well they criticized Caitanya Mahaprabhu also.” The devotee said, “You don’t understand they are criticizing me.” Prabhupada said, “No they also criticized Caitanya Mahaprabu.” He is the Supreme Personality of Godhead and still they are criticizing Him. God comes and many people all they do is criticize Him calling Him a thief, calling Him a debauchee, calling Him a killer, murderer. I am actually not responsible. I am simply fulfilling whatever desires the conditioned soul has. I am sitting there, yes, I am watching it but I am sitting there in the heart watching everything that’s going on but I am sitting as a neutral. Now what is actually our problem. Due to the fact that since time immemorial we have tried to imitate Krishna therefore so many desires have been accumulated and they are passing through our minds and along with those desires as they cover our consciousness, they cover our intelligence also. Therefore we don’t see things properly, we don’t understand things properly, we don’t feel things properly and therefore we don’t do things properly. No, in the beginning we have to understand what are the desires. What are the desires in Krishna consciousness and what are the other desires, spiritual desires, the desires coming from Krishna, the desires coming from Krishna through His line of disciplic succession. If we can understand those desires and if we can understand the other desires then we can actually orient ourselves properly. Are we really on that platform that our will should become supreme, that we should impose our will on other people or even other devotees? 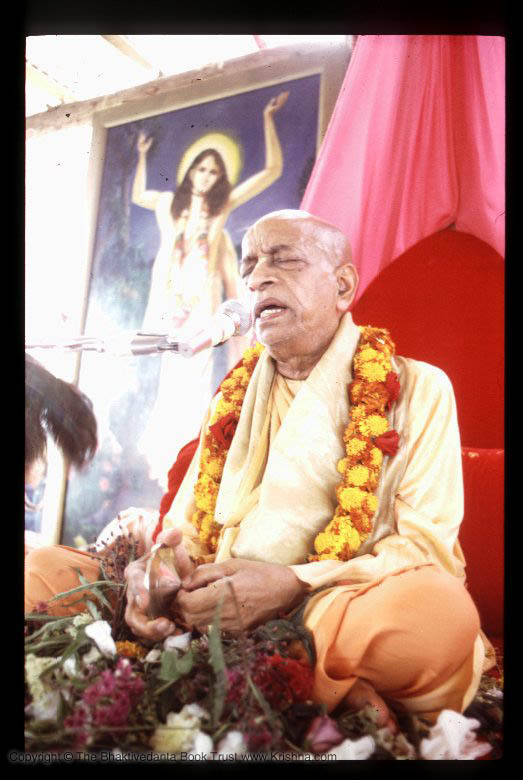 Or are we also subjected to the modes of material nature and although we may understand something about Krishna consciousness, although we may have some realizations that we want to share with others, although we may have some desire to help the the conditioned souls can come back to the spiritual world, but can we do that independently? Can we do that with full conviction, that I am better than everyone else? Or do we have to work cooperatively in the sankirtana movement? So therefore Krishna came, He displayed His pastimes in this world, He wants His pastimes to be all over the world not only in Vrindavana. He wants Vrindavana everywhere. And therefore Caitanya Mahaprabhu came five hundred years ago to show how to bring Vrindavana everywhere. Although He did not travel outside of India but Sri Advaita Acarya said, “My dear Caitanya Mahaprabhu wherever You are that’s Vrindavana.” So our business is to bring Caitanya Mahaprabhu everywhere. But who actually brought Caitanya Mahabrabhu everwhere? That’s Srila Prabhupada! Our Srila Prabhupada! He went all over the world and he brought Caitanya Mahaprabhu everywhere. So if we want to follow Krishna’s orders and if we want to follow Caitanya Mahaprabhu’s orders, then we have to follow Prabhupada’s example through Prabhupada’s orders how to spread Krishna consciousness everywhere. And what is that method he gave us and what is he trying to achieve? He is trying to simply convince people that Krishna is the Supreme Personality of Godhead, that Krishna is the owner of everything. Krishna, whether you say Krishna or God or Jehovah or Allah, Krishna is the owner of everything in this world and everything is meant for His pleasure. And He is actually the well-wisher and friend of everyone. He will live in his instructions and those who follow his instructions will live with Prabhupada. But Prabhupada is not alone just like a king is not alone. He is with all his confidential servants and associates. So Prabhupada is not living alone, he is also living with his confidential servants ands associates. If we want to serve Srila Prabhupada then we will also have to please them. Even we may think they are not elevated, as elevated as Srila Prabhupada, but Prabhupada used to say “you love me you love my dog”. Not that his servants arei anyhow we’d love to become Prabhupada’s dog. Even Krishna has a dog in Goloka Vrindavana. So we have to become servant and what is the mission? How to convince people that Krishna is the Supreme Personality of Godhead. 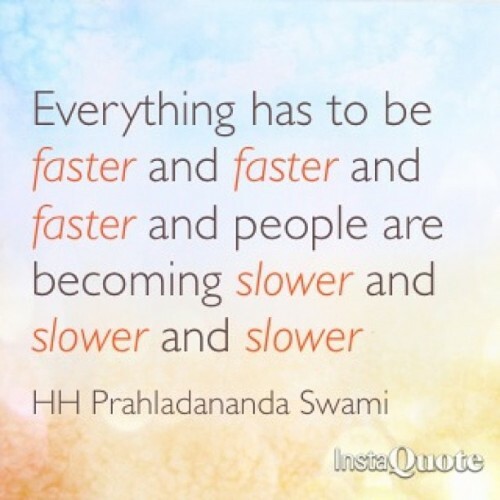 What did Prabhupada stress above everything else? Not only chanting Hare Krishna as part of our sadhana. That he wanted us to do as a basic principle and then become qualified to participate in the mission of Caitanya Mahaprabhu. And what is that mission? Prabhupada said it is a cultural revolution. It’s a cultural revolution, a crusade. What kind of crusade? Of dioramas, drama or music or concerts, everything and everyone utilizing their talents in the service of Krishna. See every opportunity to utilize all his energy to dovetail it in the sankirtana movement, in the chanting the Holy names. So when we are chanting Hare Krishna it is not an ordinary chanting of Hare Krishna. We are not only eventually going to remember Krishna and Srimati Radharani when we are chanting Hare Krishna, but we are also going to remember Caitanya Mahaprabhu and His pastimes. And not only are we going to remember Caitanya Mahaprabhu and His pastimes but eventually we are also going to remember Srila Prabhupada and his pastimes. We are calling out to Lord Krishna to engage us in His loving service, we are calling out to Srimati Radharani to engage us in Her loving service, but that loving service is the sankirtana movement as brought to us by Srila Prabhupada. That is the ISKCON movement, that we are calling out to Krishna and Srimati Radharani to not only engage in the society but engage in a loving way, in a loving reciprocation with our Godbrothers, Godsisters, Godnephews, with everyone in this movement, to engage in our loving service to Srila Prabhupada and engage in a loving way with all the devotees who are in different levels of spiritual attainment. To learn that knowledge as to how to follow Srila Prabhupada’s instructions so that we learn how to cooperate in a unified way, appreciate the qualities of the devotees. Develop love for them and appreciation, cooperation so we get the strength, the determination, the conviction, and the vision how to convince the others who are innocent that Krishna is the Supreme Personality of Godhead. Utilize everyone’s talent whoever they may be to join people together within the society first with love and devotion and then the innocent. In that way not only unite our society with love and affection all the members, to learn the art of loving exchanges within our society but then to extend it to all the Gaudiyas to unite them together all with this focus that Krishna is God. We can put aside our differences but we must conquer the world for Krishna. That’s the vision that Srila Prabhuapda had. Forget about all these other things but conquer the world for Krishna then you can fight afterwards if you want to. Now why just unite the Gaudiyas, unite all the Hindus together, unite anyone who believes in Krishna. Let them join the revolution, the cultural conquest. And why just the Hindus, anyone who is religious, let them be convinced that there is a God and we should utilize our energies to please Him to glorify Him. So we can unite together in that principle then it is much easier to put aside our differences. Then Srila Prabhupada will be pleased. He will reveal to us all our great acaryas and their mission. Our great acaryas will introduce us to the six Goswamis. The six Goswamis will introduce us to the Panca tattva. The Panca tattva will introduce us specifically to Caitanya Mahaprabhu who is feeling separation from Radha and Krishna in Vrindavana. And if we fully engage our energies with as it says here with great pleasure and with great faith, with great determination, with great steadiness, the more we do that then the more we can enter Vrindavana with the ecstatic feelings of separation as given to us by Caitanya Mahaprabhu His exalted followers such as Srila Prabhupada and His faithful followers too. Thank you very much! Srila Prabhupada ki jai! Are there any questions? Devotee: . . . good qualities of the Practeas how exalted they were, gentle and they followed the order of their father. But coming out of the water the first thing they did was they destroyed all the trees growing out there. They seemed to be very angry, their frustration, their mystic power of some kind. So much so that.. stop. So I am always confused about the praising of their good qualities and this destruction of the trees. Is that a manifestation of some kind of good quality, I don’t understand why the anger and burning of trees. Maharaj: As far as I can remember the trees were interfering with the ability of the residents to get proper nourishment. So it became a question of priority – to protect the citizens or to protect the trees. The Pracetas as far as I remember they decided to protect the citizens. So sometimes someone has to make priority. It’s not that the Pracetas came out of the water and thought well now we have got we wanted after so many years. .. it was there duty. And they performed it. We don’t know, it is not explained their consciousness but we understand they are pure devotees and therefore their consciousness was not out of envy or . . . but was their duty if not out of service. Devotee: You mentioned the example of Dhruva Maharaja who rejected the order of the spiritual master to go home? Yet even he did and even though his motivation was wrong to be bigger than Brahma he attained ultimate spiritual perfection. Can you comment please? Maharaj: I didn’t mention Dhruva Maharaj. I mentioned only Bharat Maharaj and Bali Maharaj. Dhruva Maharaj is a little different. Narada Muni appeared there and Dhruva Maharaj said you know I want a kingdom greater than my great grandfather. And Narada Muni to test him said why don’t you go home? You are too young. When you get older you can come back and then you can actually take up self realization, but Dhruva Maharaj said no I am going to stay here, if anyone wants to go home you go home, I’ll stay here. But that was just testing his disciple. Devotee: Hare Krishna Maharaj: if you can reconcile. I just came from Kenya from interfaith conferences and lead marches for chanting Hare Krishnaiwe were telling people they should get along and we asked them to forgive each other. Why do we sometimes have a hard time forgiving factions of devoteesinothing even close to that. Maharaj: Devotional service is a gradual process. I remember when I first joined we had two brothers in the movement they used to fight quite a bit. And I used to go, at that time they were living in 61 Second Avenue. I was wondering about that till Prabhupada said one day that they are just like two pups in the same litter fighting with each other. So our fighting is a little different. Even in fourth canto, I think Bhaktivaibhava Maharaj read that verse in his class, it says that our fighting is not ordinary fighting sometimes if the basis is to please Krishna. There may be disagreements at times. We may disagree how to please Krishna but because Krishna is the basis, the center, therefore it is not ordinary fighting, it is actually spiritual. If we are fighting out of envy then Krishna will help us or maya will help us. But these are not ordinary, devotees activities. Devotee: Hare Krishna Maharaj: what should be our attitude when we are the object of criticism? Maharaj: Who are ‘we’? Well if you know who you are and the person is so elevated that he can actually criticize you, who you really are, then it will be quite blissful. Now if you take off your shirt and everyone who walks by says Bad shirt! Bad shirt! Will you fell offended? So when people criticize us who are they actually criticizing? Do they actually know who we are? Do we know who we are? So then if they actually, they are criticizing our shirt or our dress whatever we have on why should we take it seriously? And if we take it seriously that’s what is serious, that’s the problem. Otherwise there is no problem, so then we should understand we have a problem. ?? And they are very kind to us because they are pointing out so if we can tolerate that, we can understand that properly, then they are helping us overcome birth and death. Because at the time of death when maya comes and drags this body, drag us out of the body, we are going to have to have a lot of tolerance to remember Krishna at that time. So these people are being merciful to me they are showing me what I have to work on and if I work on that sincerely they become my guru. They have taught me how to overcome birth and death. Who is going to say oh! Such a good body I have, look at my blood and skin and whatever else I have, how can I possibly not love it? If I peel the skin that one inch then you will appreciate it. What we are disturbed about is not that they are attacking our body not that they are attacking our appearance, not that they are attacking our feelings, but they are attacking our false ego, they are attacking my idea that I am something special that everyone should love me. Once we feel that then it becomes intolerable. We want to be loved and appreciated Maybe we should learn from them, maybe because after all we dasa dasa anudasa. Especially if it is a devotee maybe it is something we can correct so that they will actually develop some love and appreciation from us. And we will be able to serve them better. So it’s an opportunity to hear from them to learn from them how we can act in a way that we can serve them better. And if we can serve them better and they love and appreciate us more then we’ll actually be doing our duty to them. Not us, Nimitta matra bhava sabhysachin, that we can act as instruments, surrender more that they will love and appreciate Krishna more. Because if we become an instrument of Krishna what they will actually see, what they will actually love, what they will actually appreciate, is not ourselves, its actually Krishna. Thank you very much! Grantharaj Srimad Bhagavatam ki jai! Srila Prabhupada ki jai! Gaura Premanande Hari Hari Bol!